Anyone that rides a Swiss train at rush hour (or on Sunday) can relate to this, oder? In fact, the crowding on Swiss trains has gotten so crazy that the SBB is considering raising the price of tickets for people who commute during the rush hour. But the real problem, in my opinion, is that people getting on the train aren't letting the people that want to get off, off. What do you think? People who won't let you near the doors to leave the train are high on my list of annoying folks that I jab with my elbow if necessary. I would hate to see the cost of a ticket go up at rush hour; I think there must be a way to add a car. Or better yet, minimize the first-class seats. Is this a subtle way to get people to pay for a first-class pass? There always seems to be an abundance of empty seats there. I should qualify that I don't commute, and it's not often that I'm training it during peak commuter times. One thing I love about the Swiss public transport is its ease of ticket purchasing. I'd hate to see that screwed up with a rush hour "tax". People who hog the doorway when you try to get out - ugh pet peeve. I just stop and look at the person in front, clearly blocking his/her way ON until I am let off. Ranks up there with failure to queue properly. As an American, I have always found the whole first/second class thing a bit strange. There'd be a whole lot more room for everyone if they did away with this. It doesn't seem fair to punish the commuters, they are the SBB's biggest business. If one considers that a train's only purpose is to take someone from point A to point B, yes, then the first class is absurd. I do like it though. Unfortunately, being unemployed right now I can't afford it (despite commuting daily to an occupation program), but when I had a real job and was spending 2hrs/day in the train, I paid my supplement, because I paid for the quieter coaches, more comfy seats and for being rested when I arrived. It wasn't just going from A to B, it was 25hours of my months that I choose to spend in a more favorable (to reading, resting, sleeping) environment. I don't know if that makes some sense, but that's why I like first class (and it won't go away). First class, from a lack of room point and ecological of view, certainly makes even less sense on a plane... yet it exists. It doesn't seem that different than choosing to travel first class for comfort. Does it seem reasonable? As someone who sometimes takes a train back home during the start of commuter "let's-all-get-back-home" time WITH a double stroller, getting out the door can definitely be a hassle. I start getting ready early, announce to my 4-year-old that our stop is next (thereby informing everyone else) and oddly (and thankfully) enough usually get offered help by those crowding the doors. My pet peeve? The folks who sit in the areas that are ideal for strollers (handicapped sections, bike areas) when other seats are available. Jo-I agree huge American cars are wasteful. And who needs to drink 32 oz sodas? No one. mrs-That would annoy the heck out of me too if I was pushing around a stroller. Ah, public transportation. It's so, well, public. I have purchased an occasional first-class ticket because of the fatigue factor that comes from being squished like a sardine in 2nd class. But it's the exception. 9 Uhr passes are a beautiful thing - it'd be great if they could help with the crowding. Ah yes, the other obstacle--people so desperate to get off the squished train that they contribute to the chaos. To those who can travel after 9, please do! 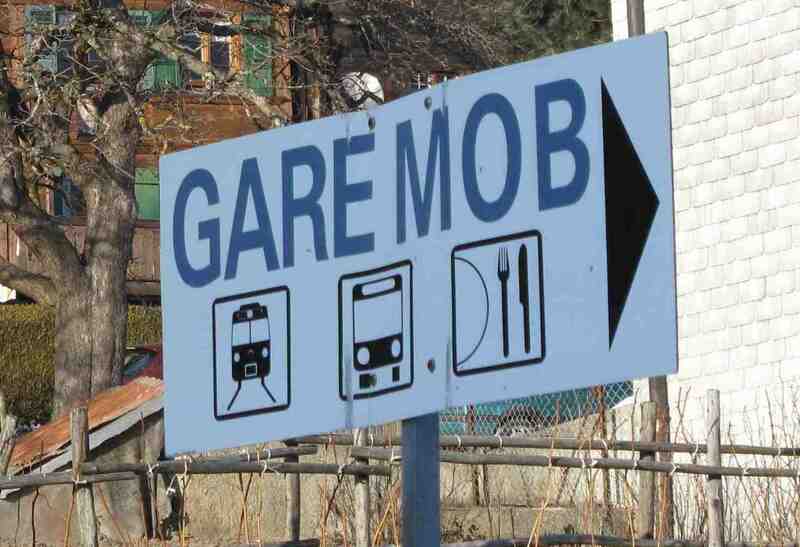 Is the "MOB" in that picture referring to the Montreux-Oberland Bahn"? 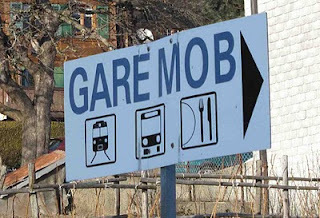 I can't imagine that the swiss would use the word "mob" to mean crowd.